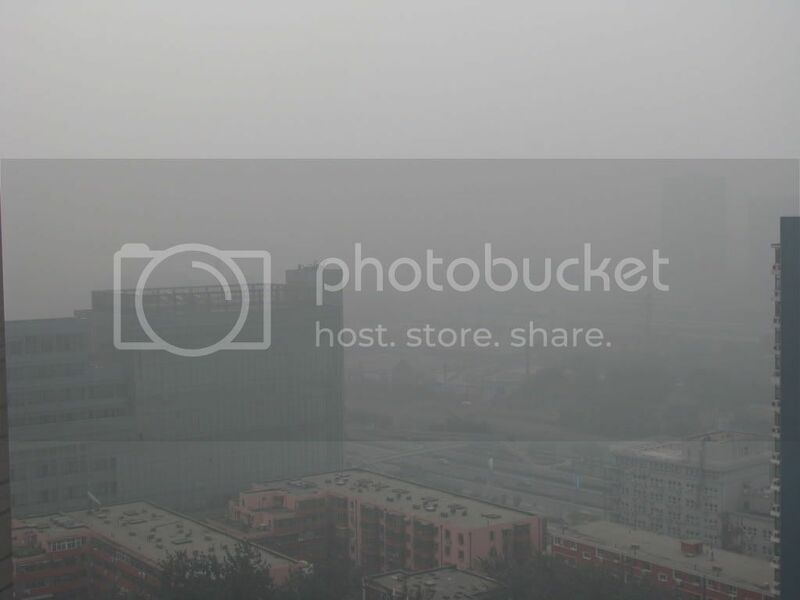 8 am, July 27, 2008, looking south, twelve days until the opening ceremonies, one week into the big shutdown of factories in nearby provinces and traffic in Beijing. I'm not sure how much of this is "mist," how much is simple moisture, how much is whatever else it might be, or how the scene might look this afternoon. This is just for the ongoing record, of what athletes like those I saw arriving at the airport yesterday might see when opening the curtains to look out the window today. Three hours later: If anything, it looks worse at 11am. I really would love to hear the conversations, which must be going on, between the International Olympic Committee and the host organizers: "Now, you've been telling us for seven years that the air was going to be fine, and... these next ten days really are going to do the trick? Really, for sure? Just thinking out loud now, what if they don't? What's our Plan B?"